What's Hiding In Your Organic Eggs? What’s Hiding In Your Organic Eggs? If you’re currently eating a bowl of instant oatmeal, or a whole wheat bagel, you may want to put it down right now. Not only are these items highly processed and unhealthy, they may contain glyphosate, the active ingredient in Monsanto’s ubiquitous pesticide, Roundup. A new study released by the Alliance for Natural Health USA tested 24 common breakfast foods for the presence of glyphosate — and found it in 10 of the foods tested. At the top of the list for glyphosate content were Strawberries & Cream-flavored instant oatmeal, whole wheat bagels and bread, and whole wheat hot cereal. Roundup is one of the most common pesticides used in the world. It is sprayed on about 94 percent of soybeans and 89 percent of corn. Monsanto has developed its “Roundup Ready” GMOs to withstand the pesticide, and the growth of these GMOs encourages more and more of the pesticide to be sprayed. Its use isn’t limited to soy and corn, and winds blowing the chemicals every which way mean it can end up virtually anywhere. It has been long known that glyphosate use carries significant dangers to humans. It has been associated with inflammation, cell damage, and an increased risk of Parkinson’s and Alzheimer’s disease, and it may disrupt hormone function. Additionally, glyphosate was labeled as a “probable human carcinogen” by the World Health Organization (WHO) in 2015. It has been correlated with the development of several cancers. What is perhaps even more disturbing than the discovery of glyphosate in processed instant oatmeal, wheat products, and hot cereal — which we already knew were unhealthy — is the study’s detection of glyphosate in eggs: both organic and non-organic. Though the levels were lower than those found in the processed items, it was there nonetheless. This finding, according to the authors, signifies that glyphosate can bioaccumulate in animal tissues, and then be passed into their products. This is highly disturbing, especially since organic eggs are a great source of protein, with many health benefits to boast. Those produced by local farmers, whose chickens do not come into contact with glyphosate-contaminated crops, may be a much safer choice. However, the glyphosate levels discovered may cast a shadow of doubt about this healthy food, until something is done to regulate (or, hopefully completely stop!) the widespread use of glyphosate in this country and around the world. “Evidence linking glyphosate with the increased incidence of a host of cancers is reason for immediate reevaluation by the EPA and FDA.” This “reevaluation” is long overdue. There are a lot of ways to enjoy a healthy breakfast, even without the eggs. You could whip up a bowl of real oatmeal, made with organic steel-cut oats and coconut milk, with some fresh, organic fruit on the side. You could enjoy a helping of protein-packed chia seed pudding. Or, for something more savory, a bowl of quinoa with some organic veggies sautéed in coconut oil. To add some probiotic benefits to your morning, try some coconut kefir water — it’s oh-so-good for your gut. Breakfast is the most important meal of the day, so make it healthy! One thing is for sure: the discovery of glyphosate in so many foods — even our healthy eggs — calls for immediate action, unless we want to continue consuming poison. Hey Buddy!, I found this information for you: "What’s Hiding In Your Organic Eggs?". 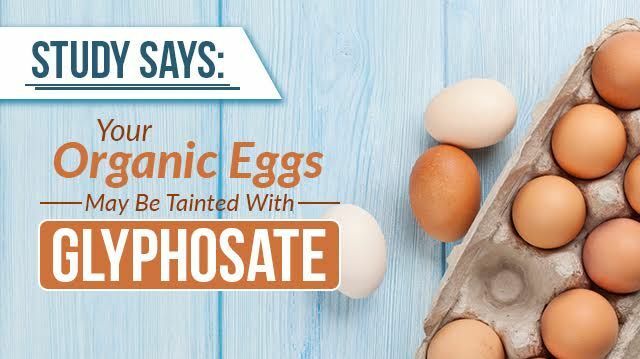 Here is the website link: https://www.thealternativedaily.com/glyphosate-in-organic-eggs/. Thank you.